Those of you who currently use vi-logger in vMA 4.x as a free syslog server for your ESX(i) hosts may notice this functionality has been removed in the latest vMA 5 release. VMware decided to remove the syslog functionality in vMA in favor of combining it with the vCenter Server. 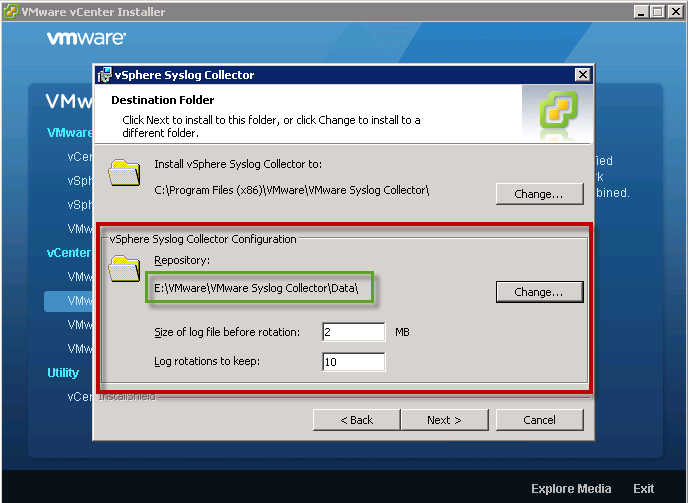 If you decide to run vCenter 5 on Windows, you have the option of installing an additional syslog collector on the same or separate Windows system and registering it as a vCenter plugin. 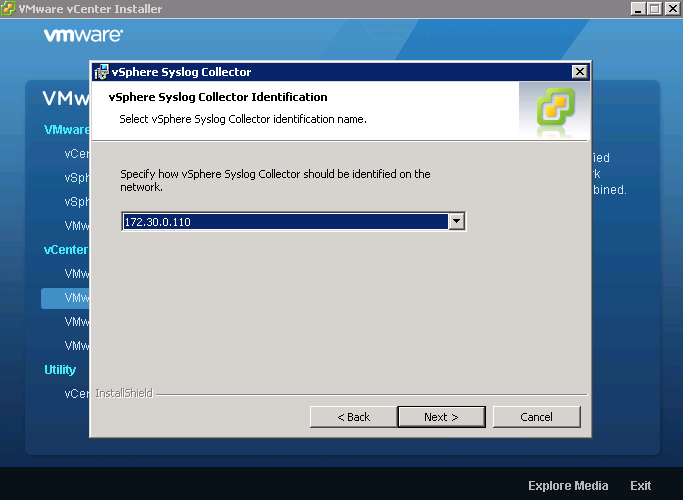 If you are using the new VCVA (vCenter Server Virtual Appliance), there is also a syslog collector that is installed by default. Using vMA's vi-logger was an easy and free solution, but you still have some alternatives without having to use vCenter or install/build a new syslog server. The following will document a free syslog solution for both a Linux or Windows platform. You can actually leverage the existing syslog server on the latest vMA 5 release and with a few customization, get it setup to start collecting logs from your ESX(i) hosts as before with vi-logger. Step 1 - It is recommend that you configure an additional disk on vMA for your syslogs as the size of vMA is quite tiny for additional use. I will assume that you know how to add and configure an additional disk, if not you can do a simple search on Google. In this example, I have a second disk that is 10GB and it is mounted up under /var/log/remote which is where the ESX(i) logs will be stored in. Step 2 - You will need to edit the syslog configuration under /etc/syslog-ng/syslog-ng.conf and you will need to add three entries. The first addition is to configure the source for log messages from the network and enabling both udp/tcp on port 514, you may add the following under the default "src" entry. The next two entries will define the destination and how it'll log. 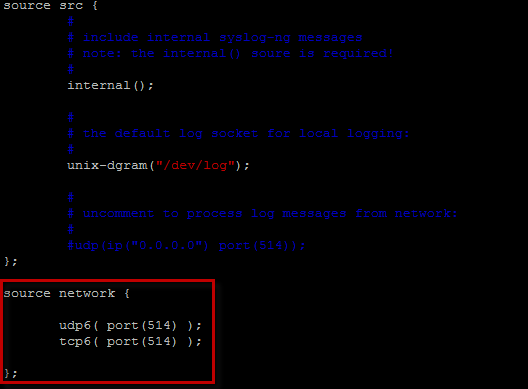 You will add the following at the end of the syslog-ng.conf configuration file. 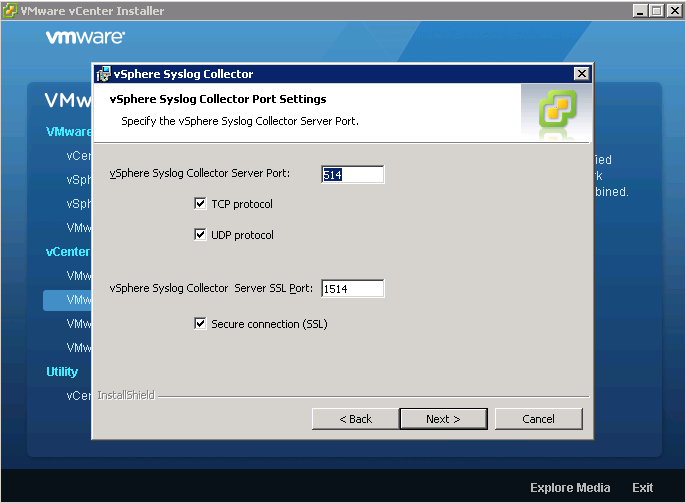 The vCenter Syslog Collector can be installed and used without the use of vCenter, you can easily turn any existing or new Windows system into a syslog server for your ESX(i) hosts for free. Step 3 - You have the option of using the local C:\ drive, but I would recommend setting up a separate drive if you can. 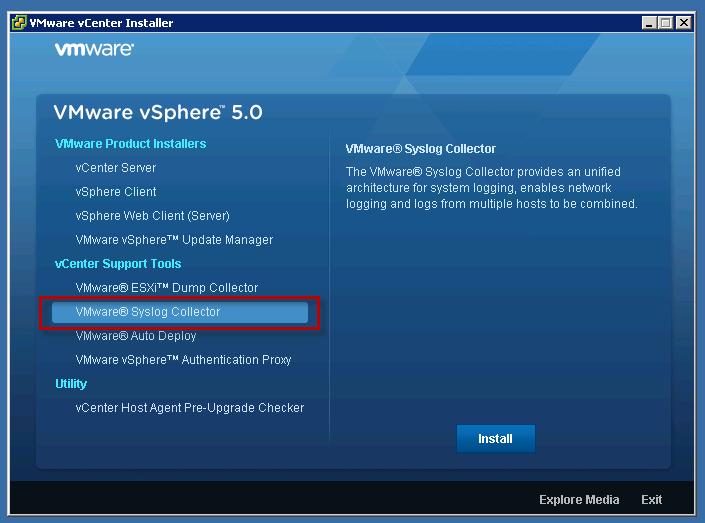 If you decide to change the default log location, you need to ensure that you specify the following directory structure VMware\VMware Syslog Collector\Data else you will run into issues with the installation. 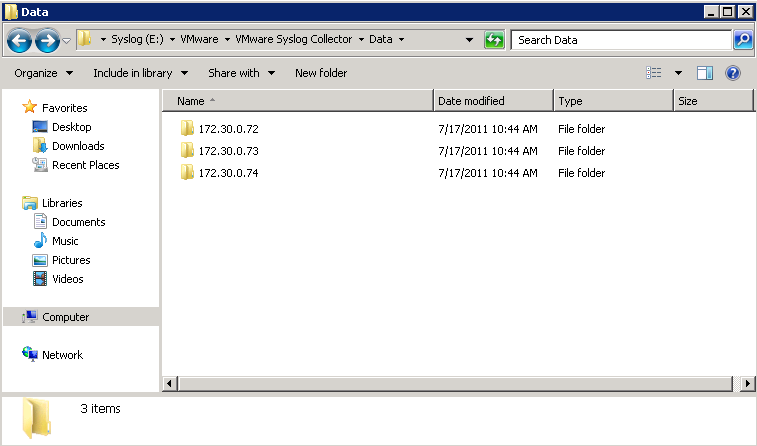 In this example, I have moved my logs into E:\ drive and the path looks like the following: E:\VMware\VMware Syslog Collector\Data. You also have the ability to change the size of the log files before rotation and the number of logs before rotating. 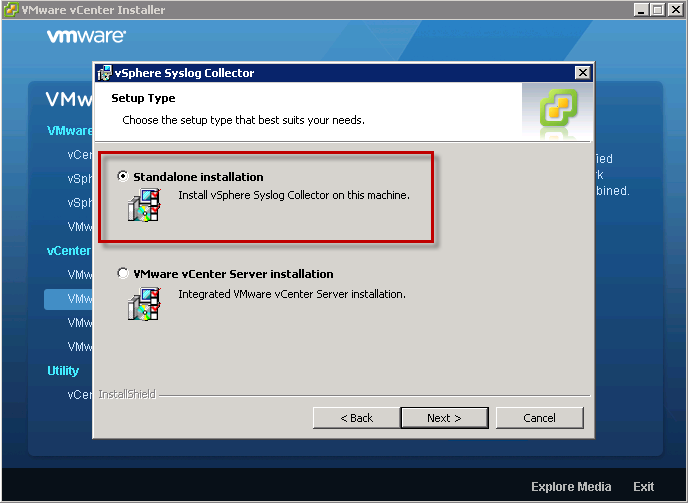 Step 4 - If you are installing the Syslog Collector on the same host as vCenter Server, you should select the integrated installation else you should select a standalone installation. Step 5 - The next screen will be the default ports to enable for both TCP/UDP and SSL which can be configured or left as the default as recommend. Step 6 - The screen is how the Syslog Collector will be identified on the network and it should just be the IP Address of the host. As you can see even with vi-logger being removed in the latest version of vMA 5, you can easily still configure a free syslog server with your ESX(i) hosts on either a Linux or Windows platform. How did you mount the drive in vMA? ext3 doesn’t work. I am sure I need to format it in some way but if you can quickly give me the commands that would be awesome! 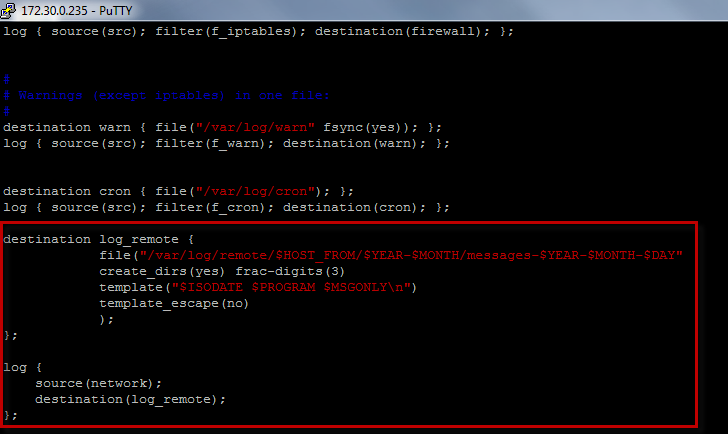 And then configure logrotate to archive my logs. Because logrotate can’t handle $HOST … $YEAR-$MONTH . Not working at all, perhaps based of pre-release version, I don´t know, but my vCenter appliance has /var/log/remote symlinked to /storage/logs/remote which is on /dev/sdb2, and there are running two syslog services: syslog (which is syslog_ng) and syslog-collector, which uses /etc/syslog_ng/syslog-collector.conf similar to what you are appending in this article to syslog_ng.conf. William, Tried configuring with vMA 5.5 for vSphere 5.1 ESXi hosts but logs are not getting forwarded after following the above article. Have you checked the firewall on ESXi hosts to ensure they’re allow syslog traffic? Oh william, i’m so glad you replied. ESXi hosts are not opened to syslog service. I have to work creating customer firewall rile. thank your so much for your quick reply. 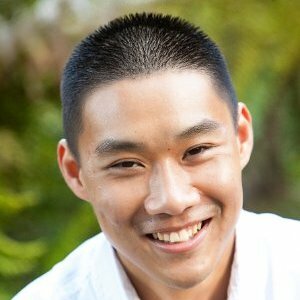 Appreciate if you can help on your “VMwareHealthCheckSript” as well.